This system allows to insert physical objects in audio digital signal processing chains, filtering the sound with the acoustic impulse response of any solid measured in real-time. Physical objects are modeled as a linear time-invariant system, which is then used as an audio filter. By interacting with the object or with the measuring hardware it is posible to dynamically modify the characteristics of the filter. The impulse response is obtained correlating a noise signal injected in the object through an acoustic actuator with the signal received from an acoustic sensor placed on the object. The system can work with any acoustic actuator and sensor. The wider and flatter the frequency response, the more transparent the measuring loop will be. The existing prototype is based on LB07 OR LB16 surface transducers (acoustic actuator), and Korg CM-200 OR large piezoelectric element (acoustic sensor). 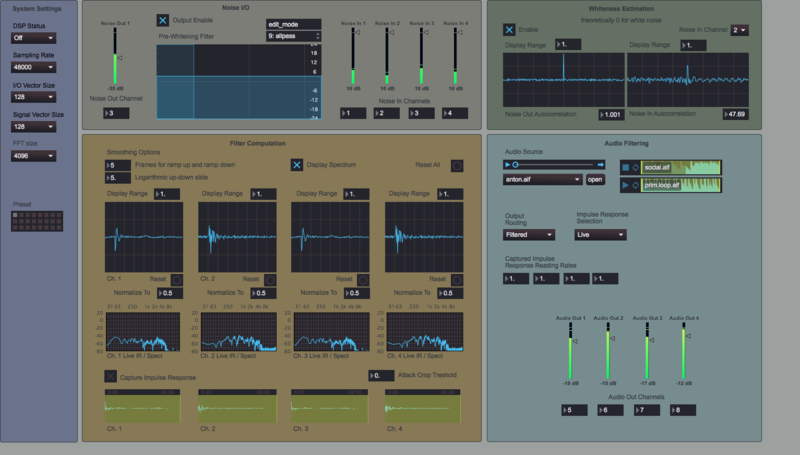 The system is implements in an efficient Max/MSP patch and supporting parallel multichannel application, enabling further creative use beyond audio filtering, such as tangible signal patching and sound spatialization.